I’ve written about Locamatic before, and while it’s good at what it does, there are some definite drawbacks. For one, the most recent version is alpha quality and stated for use on Mountain Lion since prior versions won’t work anymore on a newer system. But as of this writing, Mountain Lion was two major releases ago. I think it’s safe to say that development has stalled, and that’s OK.
Why is it OK? Check out ControlPlane, right now. It does everything Locamatic did for me and so much more. I’m reminded of the “as seen on TV” ads where the narrator expounds on the features of the particular gadget: “It slices! It dices! It juliennes fries!” In all seriousness, it is much more flexible. You define contexts (home, work, etc. ), rules, and actions. The rules are based on evidence sources such as nearby wifi networks, time of day, attached monitor status and lots more. Any change in the evidence sources that your rules are based on will cause the rule to be re-evaluated. 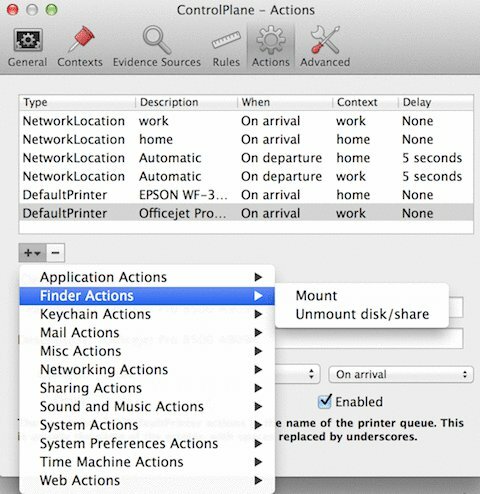 Finally, the actions allow you to change all sorts of settings like mount or unmount a volume, speak a phrase, change iChat status, change location and default printer (which is really what I want). You can even define an action to run a script of your choosing. The context/rules/actions paradigm it uses is just like an Android app I love called Llama. ControlPlane isn’t perfect, but it’s damn good. Long Live ControlPlane! is original content from devolve.